The second patient to benefit from a full heart transplant in the UAE, Sultan Al Muhairi, has passed his three-month milestone and is currently doing well, the Cleveland Clinic Abu Dhabi announced on Sunday. The 38-year-old Emirati was one of four patients who received organs in October 2018 from a single brain-dead patient at Mafraq Hospital in the capital. Al Muhairi’s 12-hour transplant procedure was also particularly complicated because it marked the first heart transplant in the country for a patient with an assistance device, a left ventricular assistance device (LVAD) that pumped blood for Al Muhairi’s failing heart. “When we first saw Al Muhairi, he had been living with heart failure for about seven to eight years. His heart function had slowly dropped to 10 per cent, [measured in the amount of blood that leaves the left ventricular chamber of the heart with every heartbeat]. In comparison, most people have a heart function of about 65 per cent,” Dr Gurjyot Bajwa, heart transplant surgeon at the hospital, told Gulf News. Al Muhairi was having trouble with his daily activities, so he was fitted with an LVAD in February 2018. But when a clot developed in his LVAD, he was hospitalised in October 2018, and moved to the top of the hospital’s transplant list. A donor heart then became available, and on October 19 last year, Al Muhairi underwent a heart transplant. The donor’s liver was also successfully transplanted into a 58-year-old woman; one kidney was given to a 31-year-old Yemeni man and another kidney to a nine-year-old Sudanese girl. Compared to the first full transplant undertaken at the hospital in December 2017, Al Muhairi’s was a longer and more complicated procedure. “Al Muhairi had already had an open-heart surgery to have his LVAD fitted. This transplant was also an open-heart procedure, and it was performed just nine months after the first. This increased Al Muhairi’s risk of infection and bleeding. In addition, we also had to carefully remove the LVAD before transplanting the donor heart,” Dr Bajwa said. To everyone’s delight, Al Muhairi recovered well, and was discharged after two weeks. “Before every transplant, we match the recipient with the donor’s height and weight. Afterwards, we routinely perform biopsies to check for rejection, with about nine performed in the first year. The patient also has to be on immunosuppressant medication for the rest of his life, and therefore guard carefully against infection risk,” Dr Bajwa explained. She added that Al Muhairi can otherwise look forward to a regular life, with heart transplant patients living up to 15 years afterwards. “This transplant, performed on a patient with an assistance device, marks the hospital’s [graduation] to a complete heart failure centre. We treat patients with heart failure, bridge with assistance devices when required and offer transplants,” Dr Bajwa said. “During the time I waited for a heart to become available, I never lost hope. My family and doctors were by my side the entire time, and I had faith that my patience would be rewarded. I had lived with my condition for a long time and I was excited to get a second chance to live my life and be there for my family,” Al Muhairi said. “Every day I listen to my heart beat and I think of the people who made my life possible. I would like to thank the donor and their family. This is truly a great step in the development of our nation,” he added. 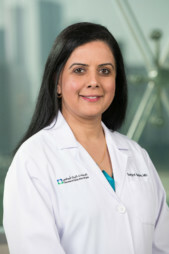 Dr Bajwa said the next step, depending on patient need, is for Cleveland Clinic Abu Dhabi to offer multi-organ transplants to a single patient, such as heart-and-kidney or a heart-and-liver transplant.